This week I chose the papers for the Brockington Lab ‘journal club’ here at the Department of Plant Sciences, University of Cambridge (I prefer to call it the ‘weekly research round-up’ though, because good content has nothing-to-do with journals per se!). We rotate the choice of papers between each lab member every week. Sometimes the focus is betalain or cuticle research, but every 3rd week the focus is on broad-interest research. The three papers I picked this week are all super-interesting and have a common theme: open research! Paper 1 by Islam et al. is what we spent the most time discussing. The Open Wheat Blast project came to my attention a few months ago via Nature News. It’s really good to see such a globally-involved multi-author collaboration where all the authors have ORCIDs, posting a preprint before the journal submission AND making all the data openly available as it happens. I won’t say too much but we did have some questions over the science of the paper — was it really necessary to do full scale transcriptomics/genomics to identify the possible origin of the pathogen? We’re not experts in plant disease but could less expensive, more targeted nucleotide sequencing approaches have given the same phylogenetic results? Paper 1 was also made available online at a preprint server which gave me an excellent opportunity to explain what a preprint server was to the group. I even tried to give an account of possible ‘negatives’ of preprinting: the only one I could think of was embarrassment if the work was demonstrably incorrect or obviously messy/unfinished (but who would actually do that?). It was also fun to read and analyze a paper in it’s unformatted state. This is what a paper looks like at submission before the imposition of a 2-column layout, journal branding, logos and other crap. It was my delight to see ‘How open science helps researchers succeed’ get published in eLife the week before the research round-up meeting: perfect timing! We didn’t get much time to discuss it but I hope our group read it. It’s a really solid review of how open research practices can help the individuals doing open science, not just ‘sacrificially’ helping others, as people sometimes tend to cynically interpret it. I was tempted to also suggest the recent opinion paper ‘How publishing in open access journals threatens science and what we can do about it‘ but it’s such a poor quality paper with so many glaring factual errors (there’s an excellent post-publication review on Publons) I didn’t even bother to send it round the group. Again we didn’t get time to discuss this in detail but I was really pleased that Caroline our visiting undergraduate from Oberlin College had read about this one even prior to me selecting it for our weekly round-up. It’s had a heck of a lot of media coverage (deservedly! ), and we hope to talk about it in depth at one of the next OpenCon Cambridge meetups — there’s been some useful discussion of it over on the OpenConCam mailing list. You might think it weird to suggest a neuroscience fMRI paper in a plant sciences group – but the relevance isn’t about the study system. It’s the fundamental need for data archiving, and statistical rigour that are demonstrably important here and it’s a lesson for all disciplines not just neurosciences. In about seven weeks time it’ll be my turn again to choose the papers. It’ll be hard to top those three papers for awesomeness though! Well done to all the authors for the great work. There are a lot of really interesting works being published over at Research Ideas and Outcomes (RIO). If you aren’t already following the updates you can do so via RSS, Twitter, or via email (scroll to the bottom for sign-up). In this post I’m going to discuss why Chad Hammond’s contribution is so remarkable and why it could represent an exciting model for a more transparent and more immediate future of scholarly communications. Well, to state the obvious first: it’s a grant proposal, not a research article. RIO Journal has published quite a lot of research proposals now, it’s becoming a real strength of the journal. But that’s not the really interesting thing about it. The really cool thing is that Chad published this grant proposal with RIO before it was submitted it to the funder (Canadian Institutes of Health Research) for evaluation. This proposal was submitted to and received funding from the annual Canadian Institutes of Health Research (CIHR) competition for postdoctoral fellowships. The updated proposal was then checked by the editorial team and republished as an updated version of the original proposal: Version 2, making-use of CrossMark technology to formally link the two versions and to make sure readers are always made aware if a newer version of the work exists. Chad’s updated proposal now has a little ‘Funded’ button appended to it (see below), to indicate that this proposal has been successfully funded. We hope to see many more such successfully funded proposals published at RIO. With permission given, Chad was also able to supply some of the reviewer comments passed to him from CIHR reviewers as supplementary data to the updated Version 2 proposal. These will undoubtedly provide invaluable insight into reviewing processes for many. Finally, for funders and publishing-tech geeks: you should really take note of the lovely machine-readable XML-formatted version of Chad’s proposal. Pensoft has machine-readable XML output as standard, not just PDF and HTML. Funding agencies around the world would do well to think closely about the value of having XML-formatted machine-readable grant proposal submissions. There’s serious value to this and I think it’s something we’ll see more of in the future. Pensoft is actively looking to work with funders to develop further these ideas and approaches for genuinely adding-value to scholarly communications. RIO is truly an innovative journal don’t you think? I know what you might be thinking: Another open access journal? Really? 2.) 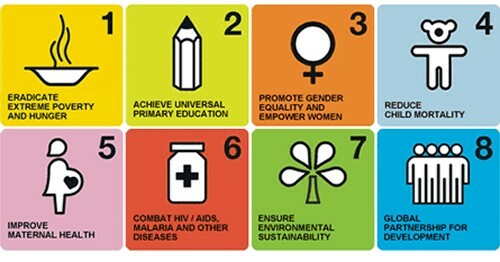 RIO will label research outputs with ‘Impact Categories’ based upon UN Millennium Development Goals (MDGs) and EU Societal Challenges, to highlight the real-world relevance of research and to better link-up research across disciplines (see below for some example MDGs). 3.) RIO supports a variety of different types of peer-review, including ‘pre-submission, author-facilitated, external peer-review‘ (new), as well as post-publication journal-organized open peer-review (similar to that pioneered by F1000Research), and ‘spontaneous’ (not journal-organized) post-publication open peer-review which is actively encouraged. All peer-review will be open/public, in keeping with the overall guiding philosophy of the journal to increase transparency and reduce waste in the research cycle. Reviewer comments are highly valuable; it is a waste not to make them public. When supplied, all reviewer comments will be made openly available. 4.) RIO offers flexibility in publishing services and pricing in a bold attempt to ‘decouple’ the traditional scholarly journal into its component services. Authors & funders thus may choose to pay for the publishing services they actually want, not an inflexible bundle of different services, as there is at most journals. Source: Priem, J. and Hemminger, B. M. 2012. Decoupling the scholarly journal. Frontiers in Computational Neuroscience. Image licensed under CC BY-NC. 5.) On the technical side of things, RIO uses an integrated end-to-end XML-backed publication system for Authoring, Reviewing, Publishing, Hosting, and Archiving called ARPHA. As a publishing geek this excites me greatly as it eliminates the need for typesetting, ensuring a smooth and low-cost publishing process. Reviewers can make comments inline or more generally over the entire manuscript, on the very same document and platform that the authors wrote in, much like Google Docs. This has been successfully tried and tested for years at the Biodiversity Data Journal and is a system now ready for wider-use. For the above reasons and more, I’m hugely excited about this journal and am delighted to be one of their founding editors alongside Dr Daniel Mietchen. See our growing list of Advisory and Editorial Board members for insight into who else is backing this new journal – we’ve got some great people on board already! If you’re interested in supporting this initiative please do enquire about volunteering as an editor for the journal, we need more editors to support the broad scale and ambition of journal. You can apply via the main website here.